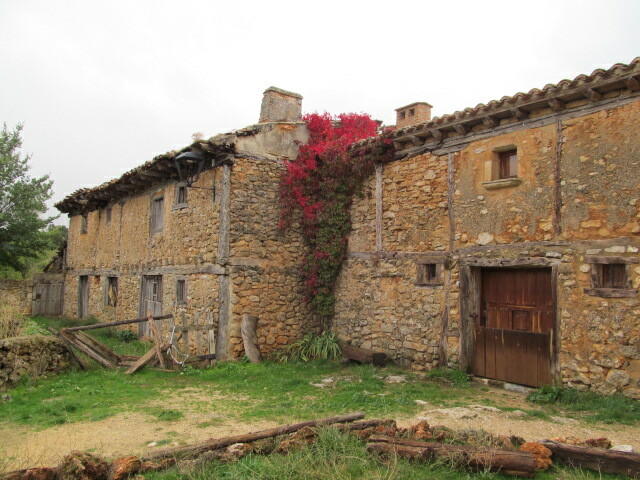 There are some excellent sites for finding hotels of all descriptions, in the major cities, in the smallest of towns, anywhere in Spain and I presume, anywhere in the world. 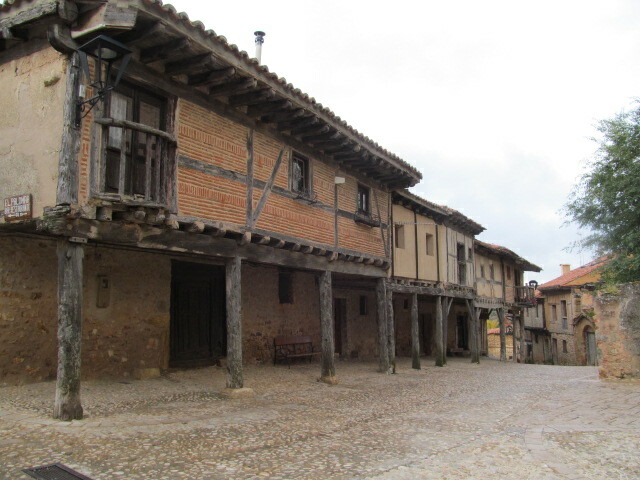 I was checking out accommodation in a small provincial capital, Soria. With limited choices, the sites will offer you places within a certain distance. 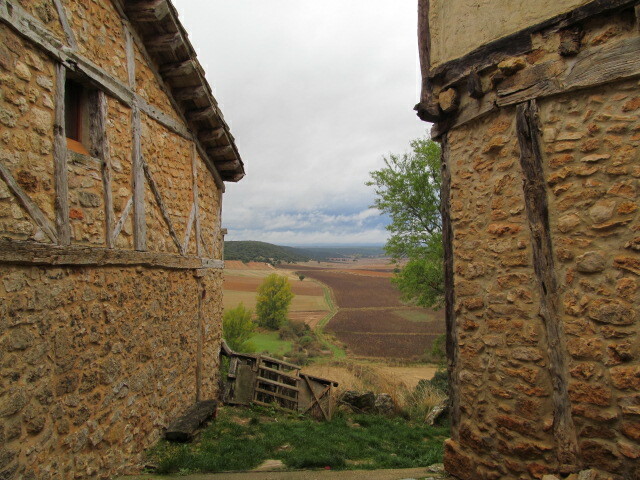 As a result, I found this village, 30 km from the city. 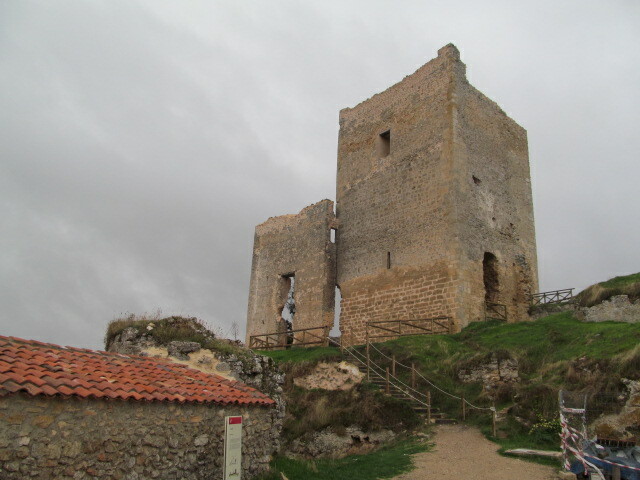 Calatañazor, tucked away on a promontory, with its own castle, overlooking fields that have been cultivated for at least most of the second millennium. 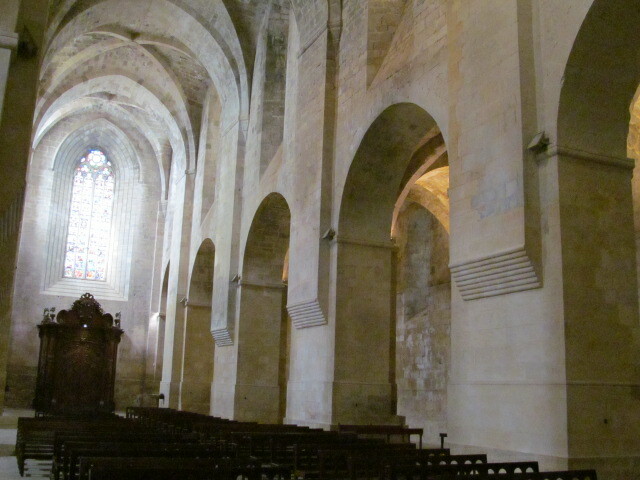 The church is 12th century. 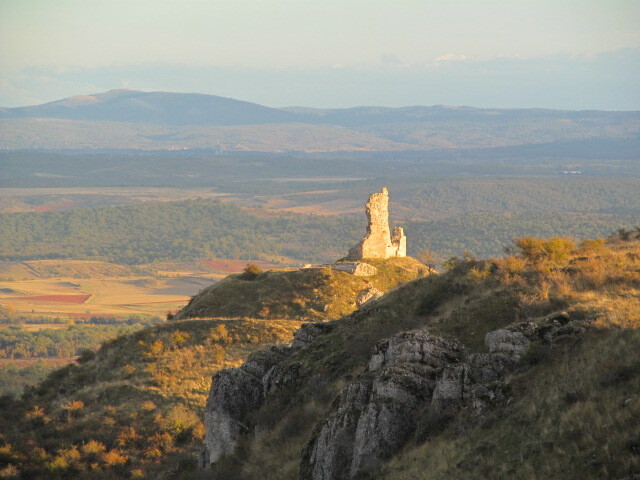 The site is legendary; a battle between Christian forces emerging more and more from the north and the Moors led by Almanzor, the scourge of the Christians, victorious in 57 rampaging campaigns against them, might have taken place here in 1002 and might have resulted in an injury which led to his death. 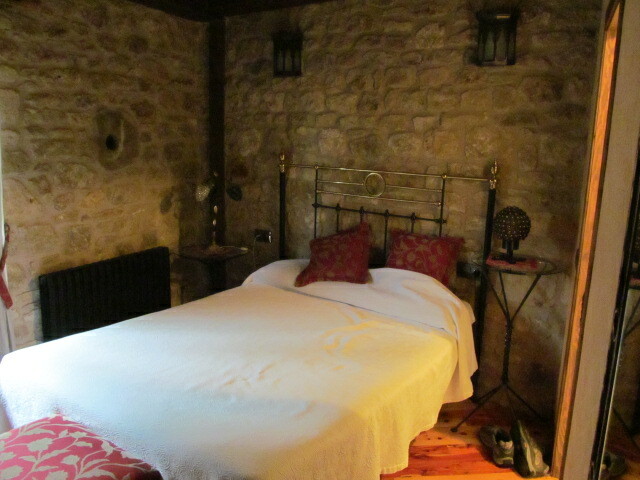 It looks very rustic, but my small hotel was very comfortable and, as they say, beautifully appointed. The highlight of my dinner was a salad with marinated wild rabbiit, partridge and quail. Second course was merluza (hake – when I say this word, I feel that I need to apologize for ‘this chronic cough’) in a green salsa with shrimp and clams. I didn’t have my camera with me. 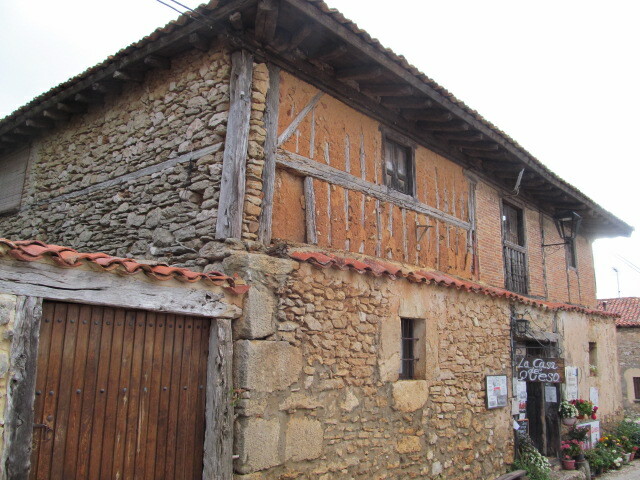 Every building was different, constructed in whatever materials were available, most of them are inhabited, many with new windows but still with their distinctive chimneys. This is still an active farming community. 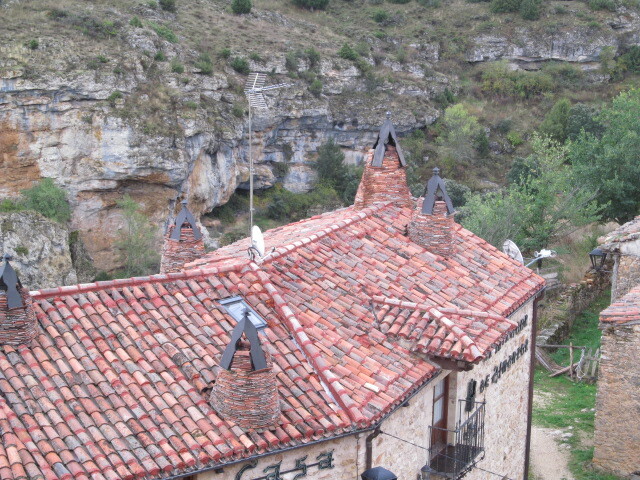 This is my hotel; it has been given a new roof and the chimneys are similar to others in the village. 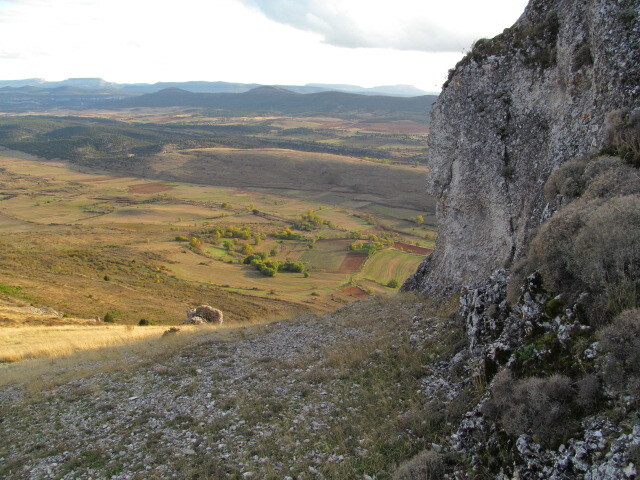 You will notice that there are cliffs on one side of the village, typical of the location of so many villages and larger towns, for defensive purposes. In the other direction, farmland. These are located just behind my hotel. Here’s one where so many different materials have been used in the walls. 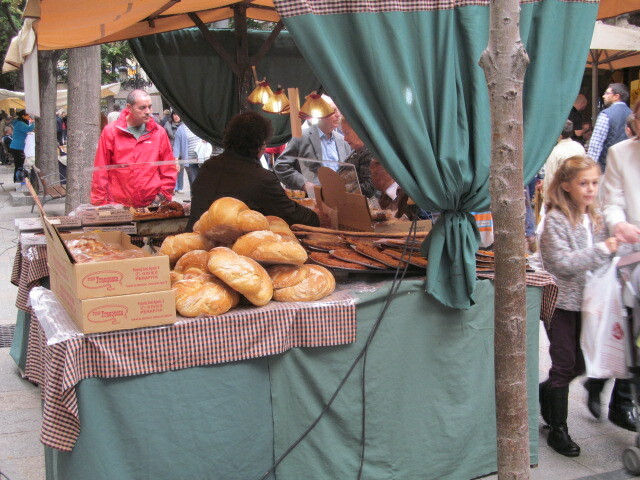 There is a small shop specializing in local cheeses; La Casa de Queso. Main street with its arcades from the other direction. And oh yes, there is a castle. Orson Welles filmed scenes from Chimes at Midnight in Calatañazor back in the 60s. And now for some more tapas, some snippets from my ramblings. 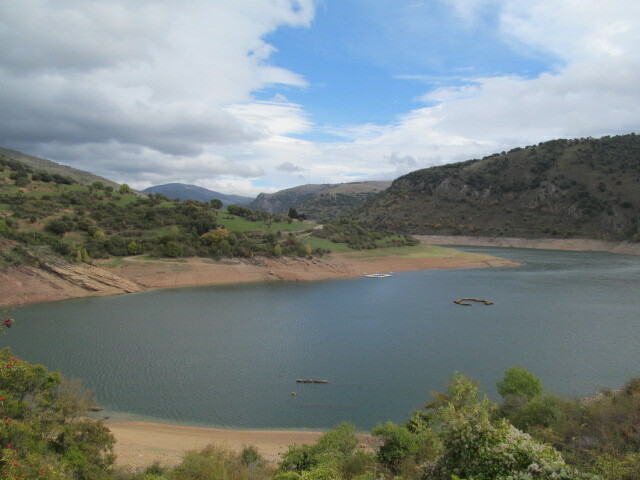 Spain has needed to build dams to create reservoirs. Looking at maps of Spain, most of the lakes have been formed in this way. For irrigation, for hydro. This has inevitably led to the displacement of villages and populations. 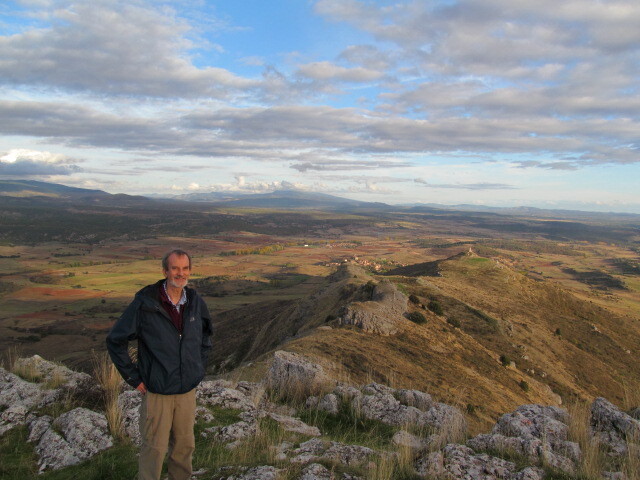 I was crossing through a particularly beautiful part of the country, the Sierra de Demanda, winding roads, incredible vistas, and came across a beautiful man-made lake. The water levels are down by this time of the year, after the long, hot summer and vestiges of the old village start to reappear. 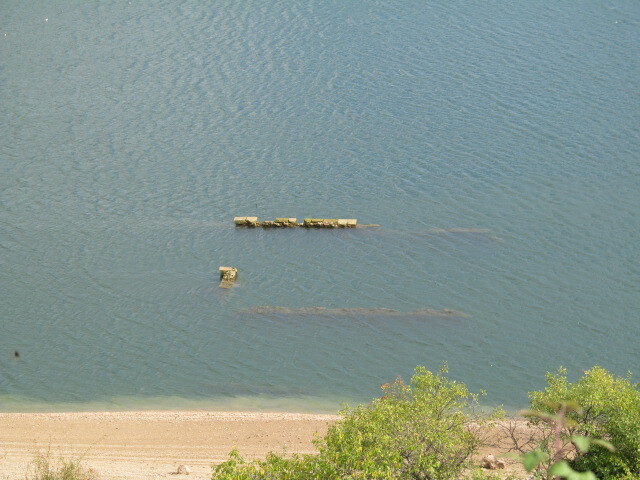 The foundations of the village church and a building closer to shore. Eerie. No, double e. Not the big lake back home. In the 30s, 600 people lived in this village. Less than one hundred live in the new village on higher ground. Progress. And apparently it was not well handled by the powers-that-were. Que sorpresa! 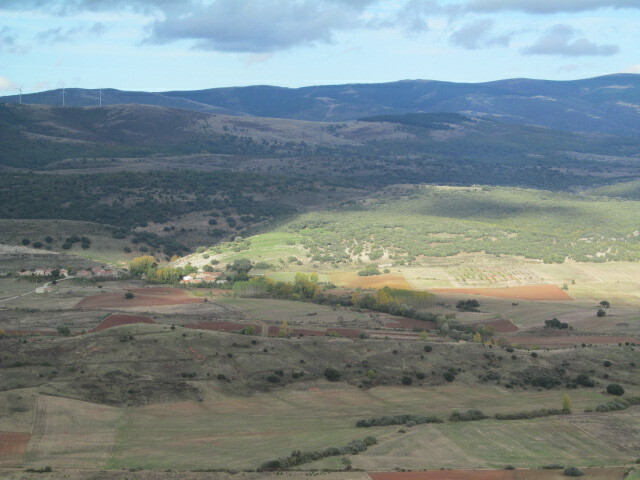 Some of the beautiful farmland in La Rioja, famous for its wines. So much of their soil is red. Always hills or mountains in the distance. Always. 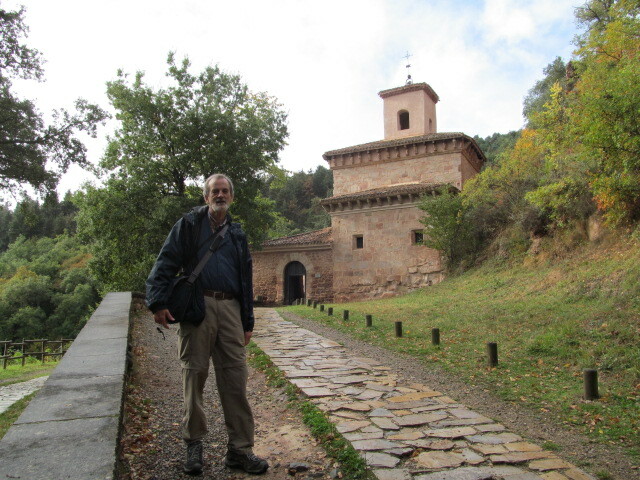 This is a famous monastery, Suso. 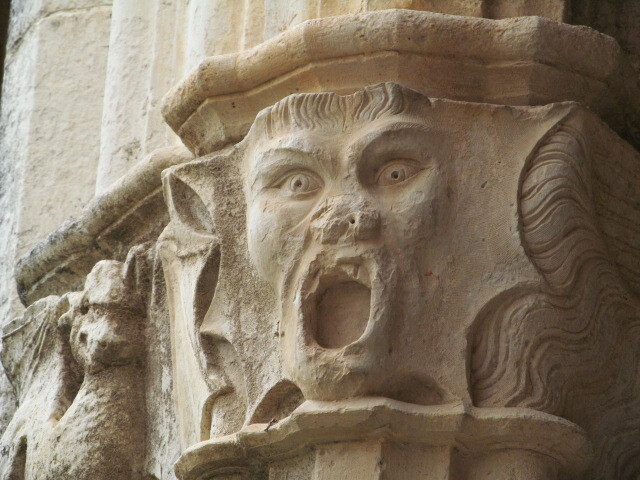 Its origins are Visigothic in the mid 6th century. 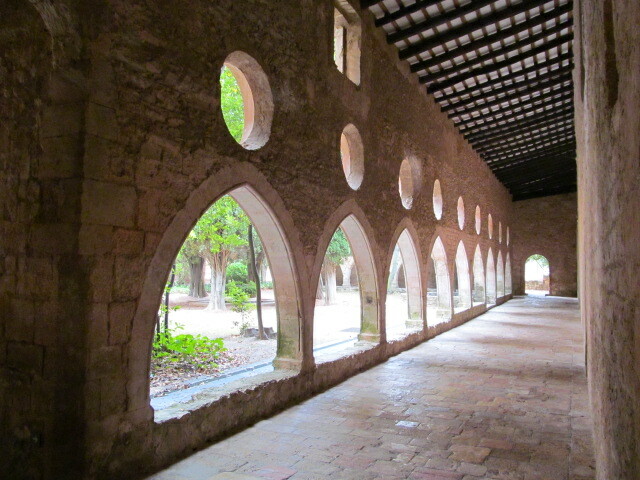 Some of the building dates to this period, with Visigothic horseshoe arches. 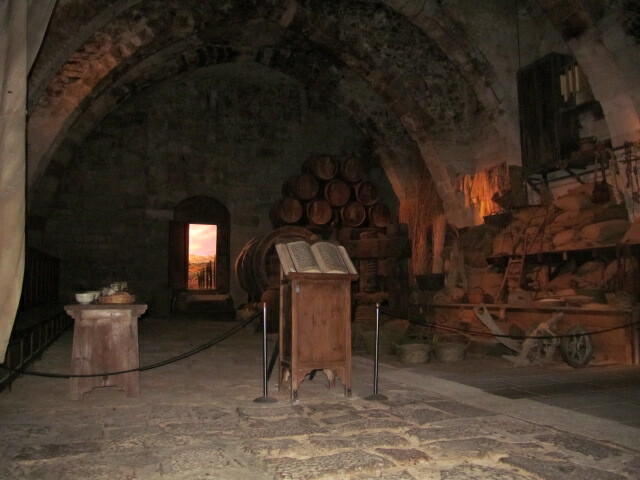 I was, of course, very excited but not allowed to take photos in the interior. 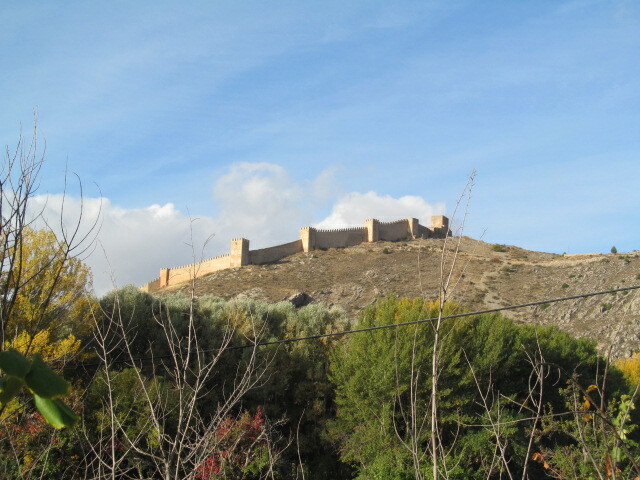 Much of the present building is mozarabe, from the 9th century, built by Christians who had been living in the south and who were beginning more and more to come up to the northern parts to join up with the Christians already living there. I did sneak this one from the outside looking in , could not resist and the wonderful guide was preoccupied with questions. 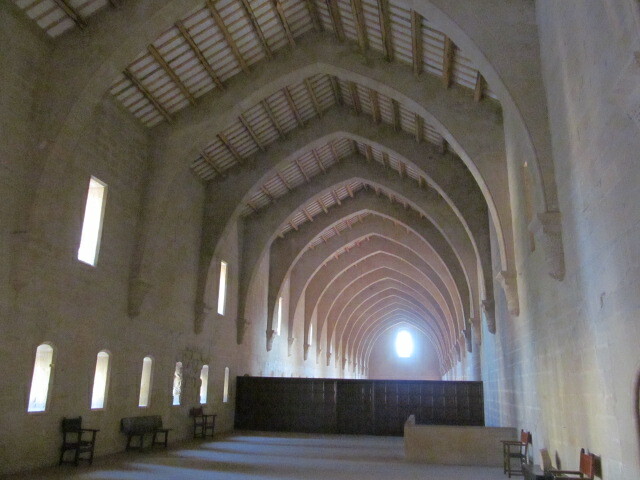 In the scriptorium of this monastery, the Spanish language in its written form was born. 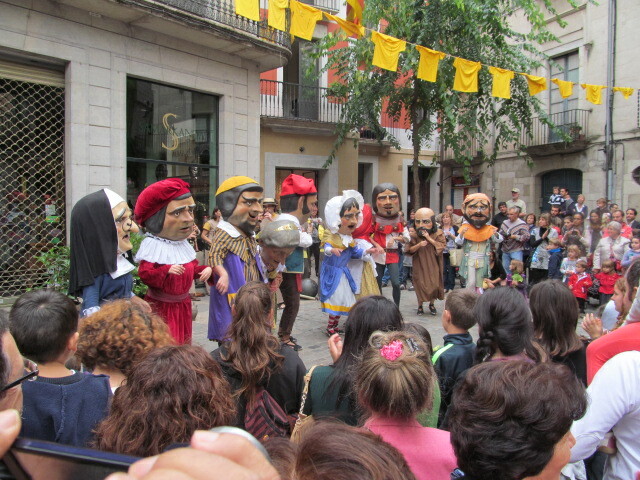 Spanish would have arisen in the streets, a village version of Latin. In the margins of a 9th century manuscript, monks a few centuries later wrote short comments in the margins in three different identifiable languages, Latin, Castillian (Spanish) and Basque. This document still exists. 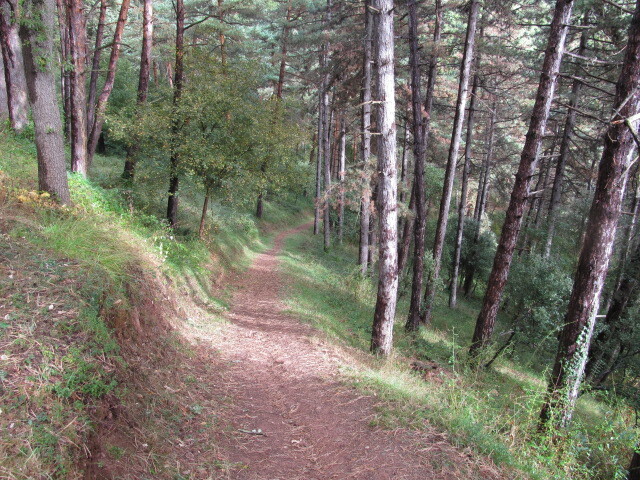 I had had to take a small bus from the village to this location; I was able to walk back through the forest after the tour. 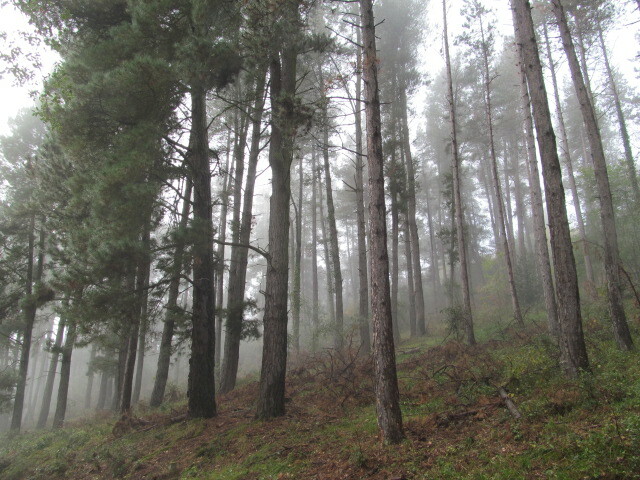 Moving through the early morning mists, the remnants of a rainy night, into the sunshine. One final photo. 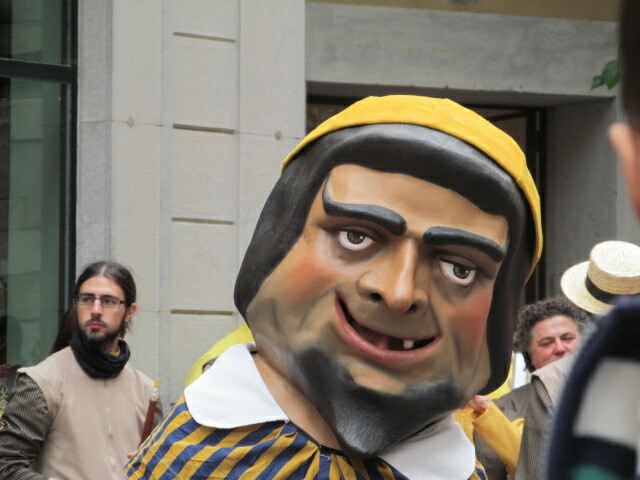 I just made mention of the Basque language. Scholars have no idea where it comes from. They have tried to connect it to the Indo European roots of most of the other European languages. They have even suggested from it is a survival from early forms of humans, Cro Magnum possibly. 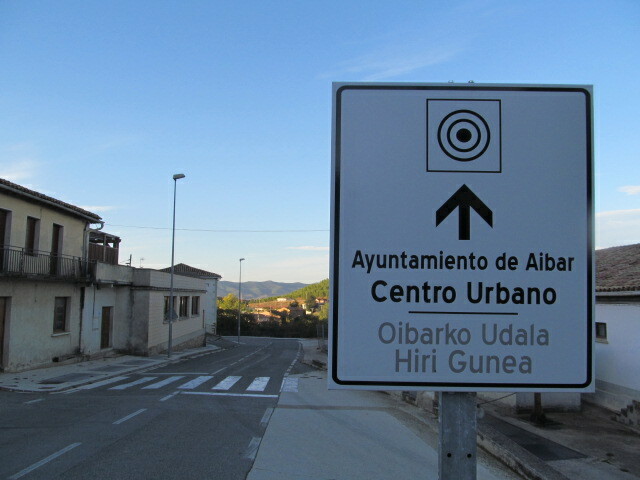 Here is a sign in a village where I have been staying, in Spanish and in Basque, both official languages in this part of Spain. The big word is town hall. You will understand the rest of the Spanish but look at the Basque – there is no connection at all. 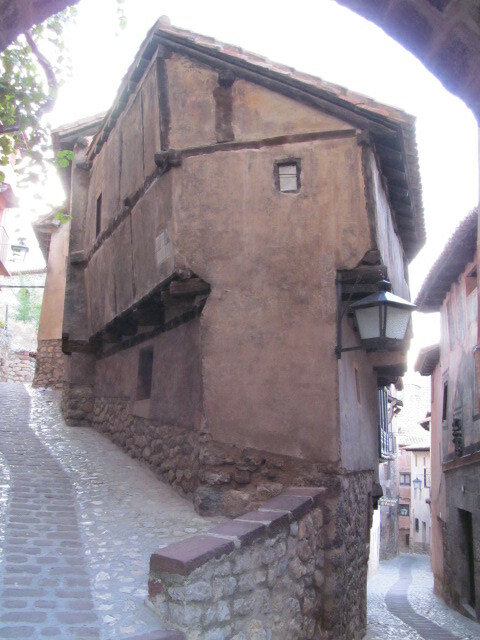 30 Albarracín – a magical delight! 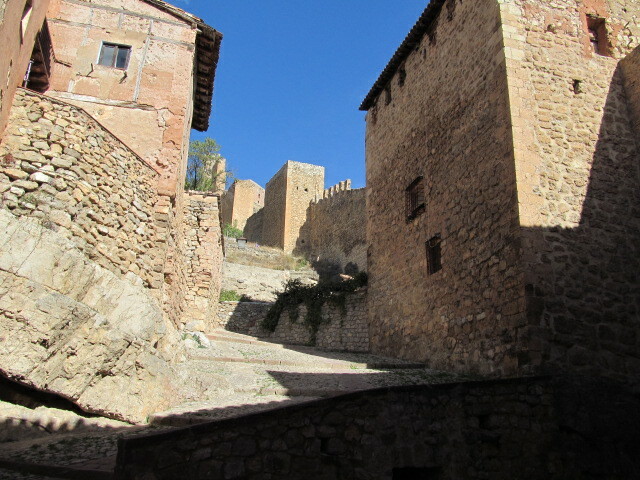 Albarracín was the capital of one of the many small Moorish kingdoms, after the united caliphate broke apart in the early 11th century. Like the 20 some other taifas, the court here was synonymous with luxury, scholarship, music, poetry and scientific and medical advances. Perusing a history of the place, I came across evidence of sophisticated tools developed here to operate on cataracts. This is what I saw in the distance as I approached for the first time. The town is situated in a powerful strategic position on a river where two gorges meet. 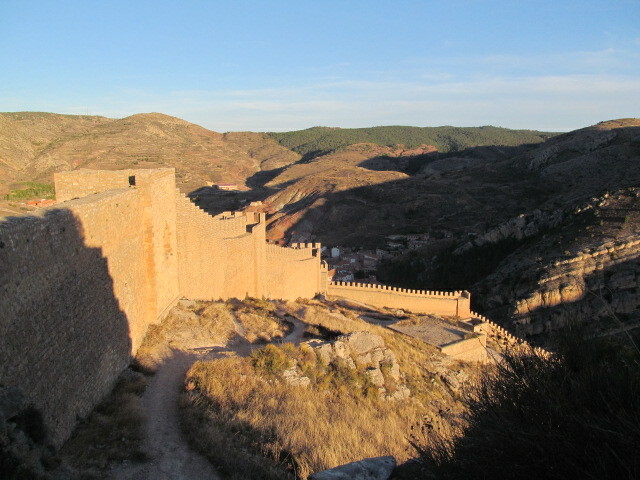 The walls in the distance protect the rear flank. 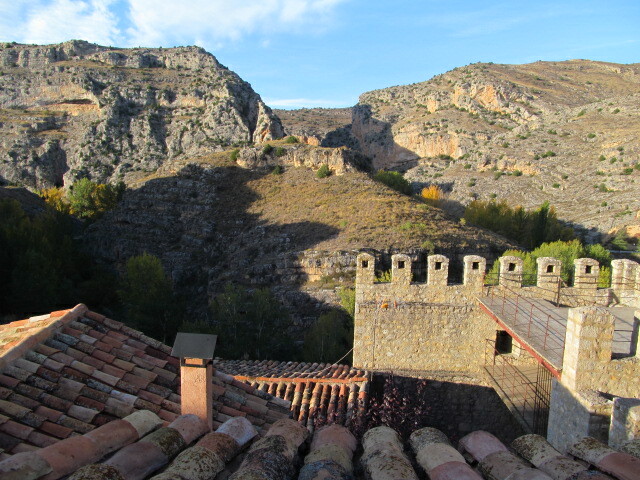 Along the river bank and climbing the sides of the gorge is the town site. Yes I have taken this photo from up near that wall. 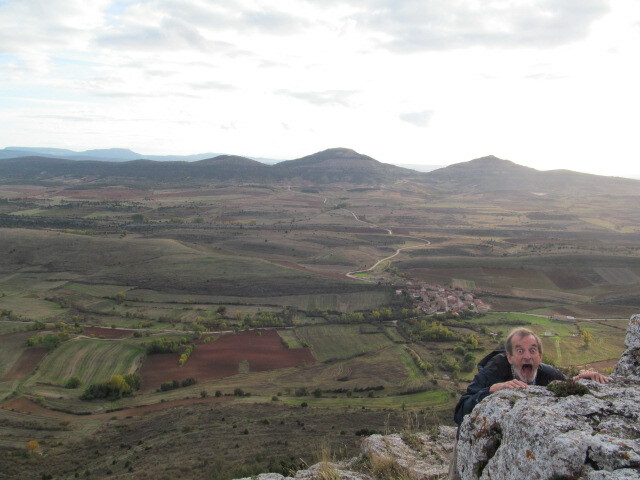 It wasn’t that difficult a climb; count to 50 steps, take a brief rest, you can do it, you old fart! Here is another angle. Now I have to choose from dozens to give you a quick sense of the place. 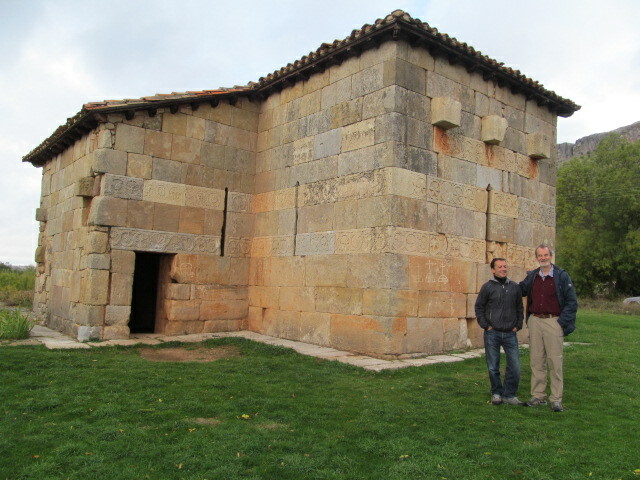 Of course, the Christians, after the reconquista, ended up with the highest building. 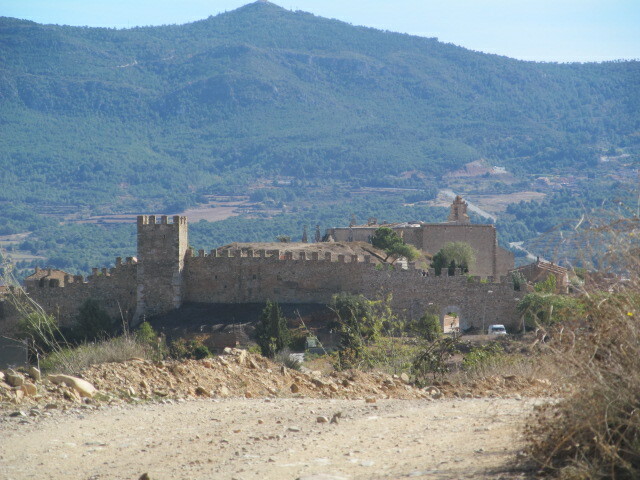 What looks like a pile of rocks to the right of the church, is the remains of the Moorish castle, the alcazar. Enough of these long shots. 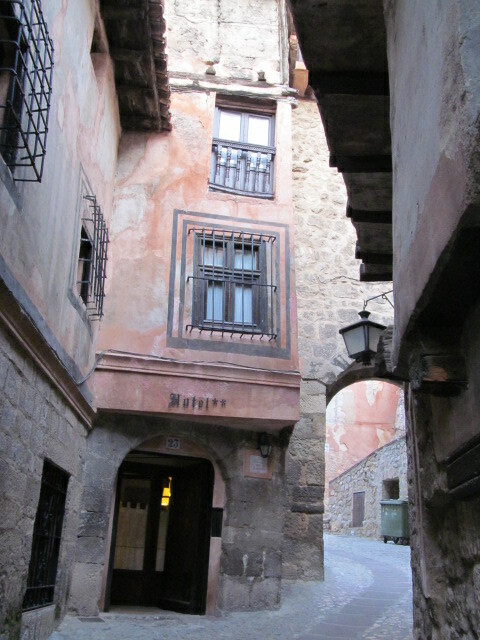 Here we are in downtown Albarracin; one of the remaining gates and the town’s most famous building, Casa Julineta. It curiously makes me think of Picasso and cubism. Did he really have to wait until the twentieth century to invent it? 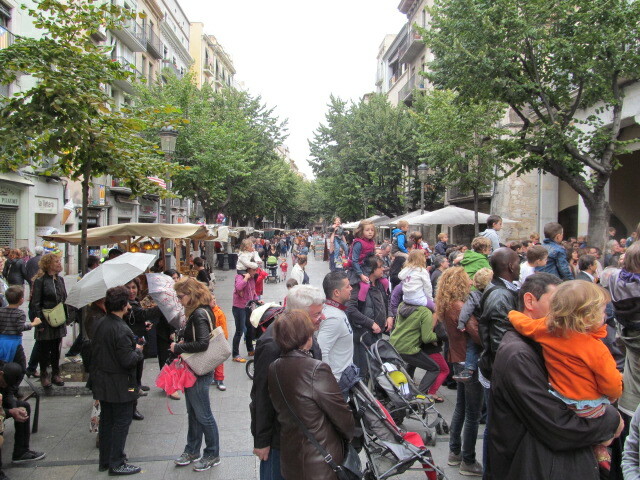 Notice the typically narrow streets. My tiny hotel is tucked in immediately to the right of this house. 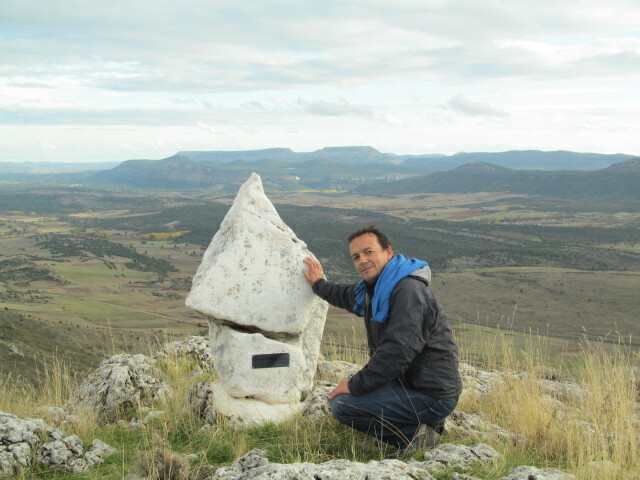 Posado del Adarve. A wonderful landlord, Pablo. Very helpful and always willing to chat; he has a library of guide and history books of the area for the use of clients on the second floor. 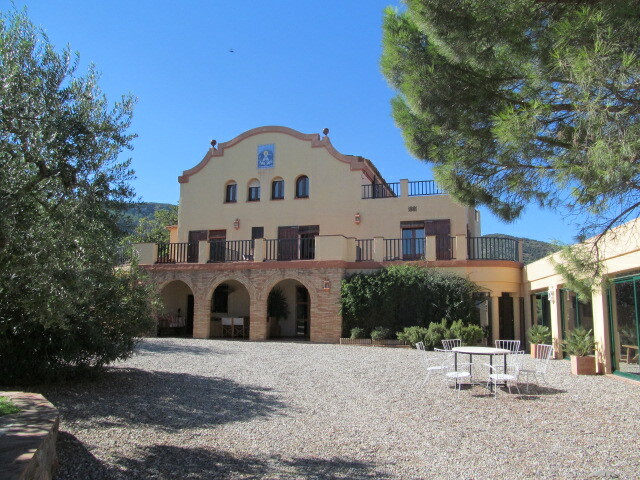 The hotel is actually built into the defensive wall – notice the gate. Here is the view from my window. Buenos días! Notice the cliffs on the other side. Defensive choice of the location. 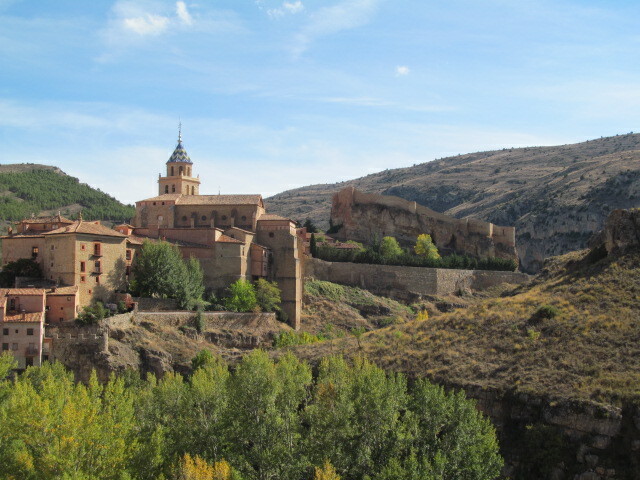 Toledo, Cuenca and Segovia, cities which I have visited, were all similarly located. 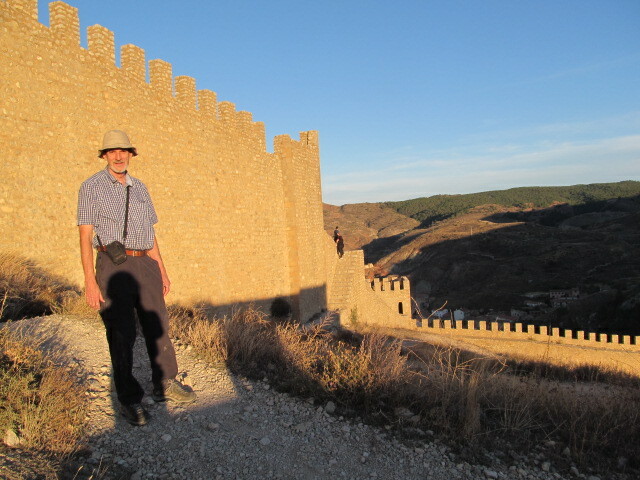 The next photo was taken just on the other side of that gate (in the shadows to the right) looking up at the ascending wall. I did climb it early one evening. It was worth it. And here’s the proof that I did it (as if you needed it). 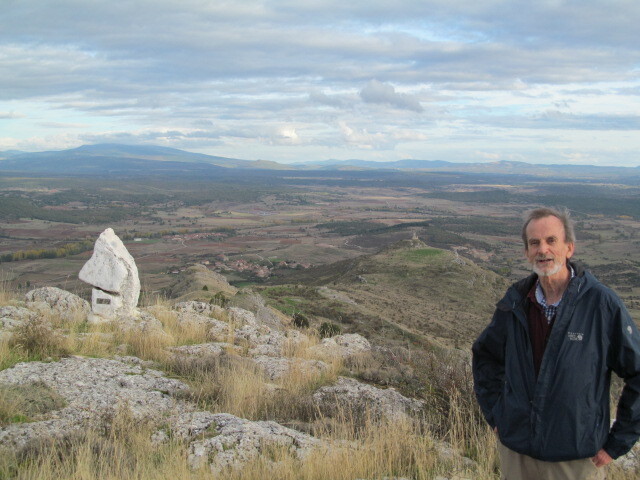 I went up as far as the square tower; earlier photo was taken from there. Now for a few more town shots. This was taken just down the lane from my hotel. 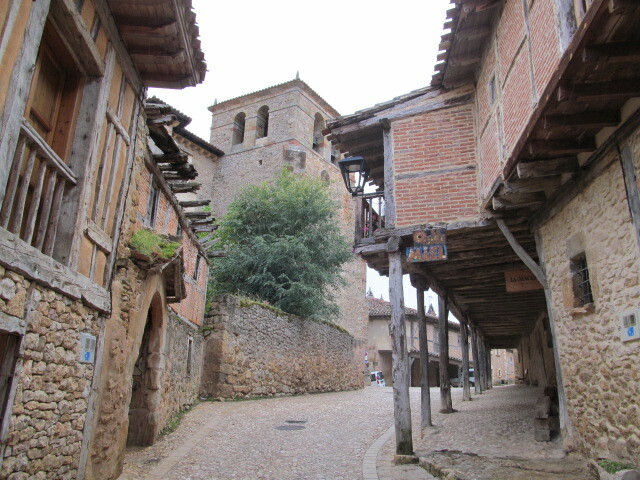 In these ancient villages, some of the buildings do rise at least six, even eight stories. Amazing. 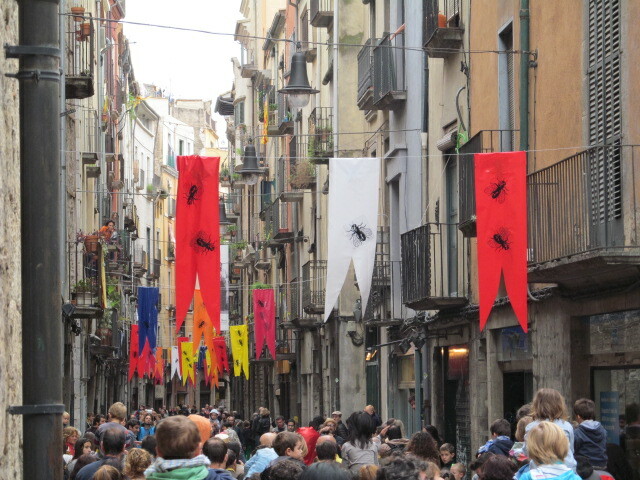 Here is the street between this and my hotel. And tucked in behind these doorways are homes, shops, bars, and restaurants. Now I didn’t take my camera. I just went out a while ago to eat lightly. The restaurant is only a few doors from the hotel. I wasn’t quite sure what the page devoted to ‘mandoditos’ was about. It turned it just another word for tapas. Without thinking, I ordered 8; the young woman said that she would choose. What a plate! What a feast! I would be embarrassed to show you the photo. 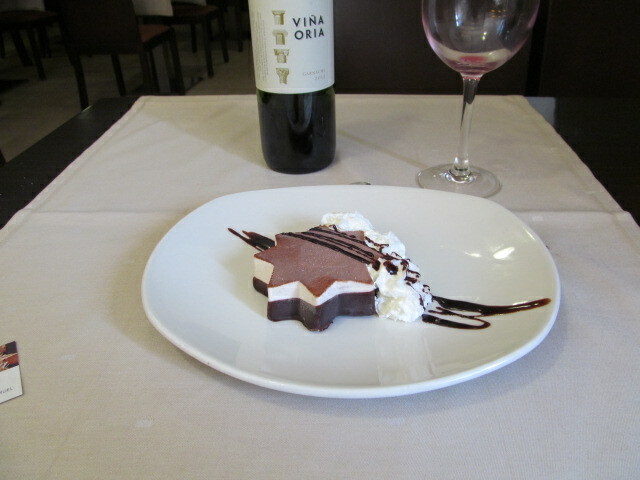 I ate like an adolescent and the endorphins are multiplying (with the help of some tinto, of course.) Good night, buenas noches, mis amigos! I will gladly return here to show you around, depending on when your flight sets down. This entry was posted in Uncategorized on October 21, 2013 by agnotarte. 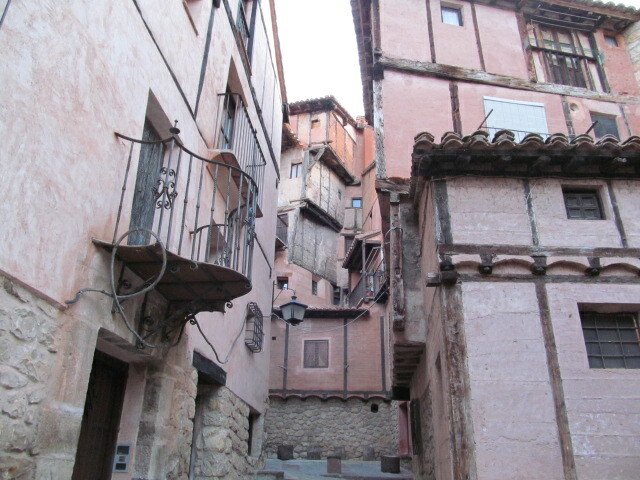 Teruel is a small, ancient city in the south of Aragon. 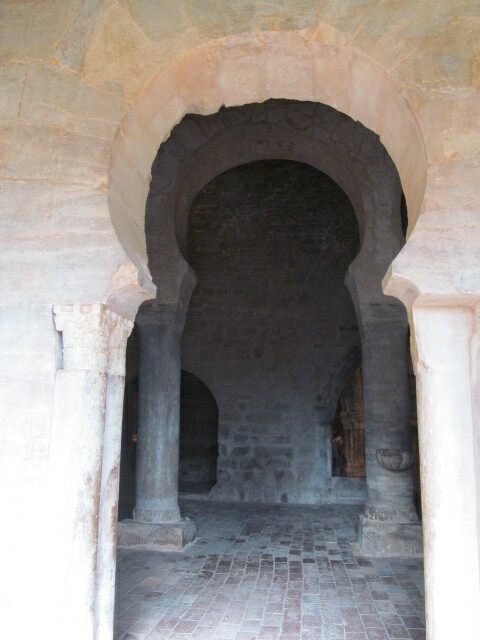 It was a Moorish capital and was eventually reconquered by the Christians. Within its walls (there are fragments of the wall as well as some towers and surviving gates), is a feast of mudejar art and architecture, a curious blend of Christian and Moorish elements that create an unique form only found in Spain. 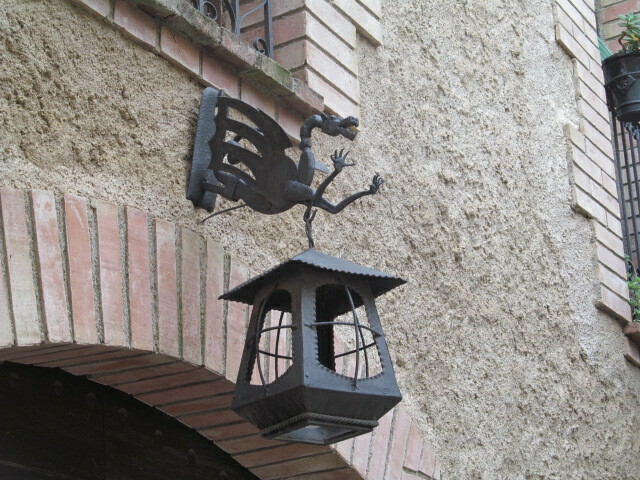 In Teruel itself are found the finest examples of the form. 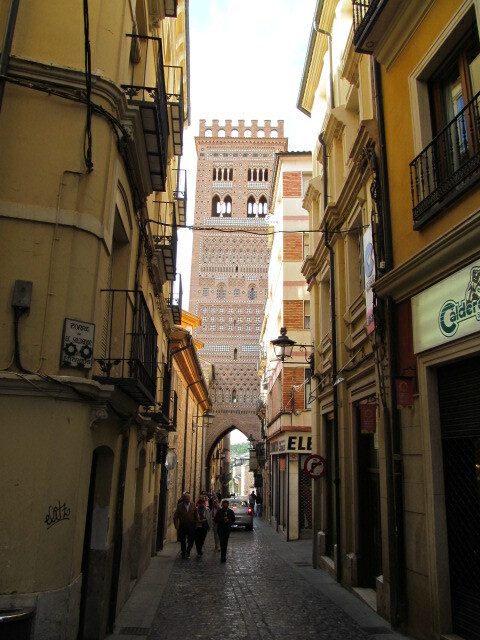 The San Martin tower is the most famous and also the hardest to photograph; it is tucked between buildings in a typically narrow street. 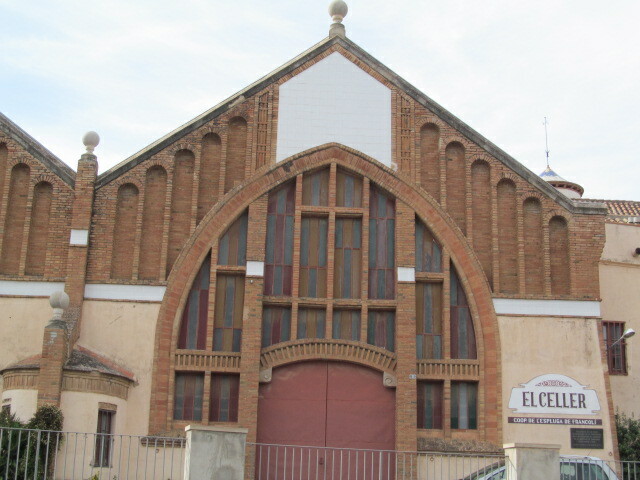 The basic elements are brick and ceramics. 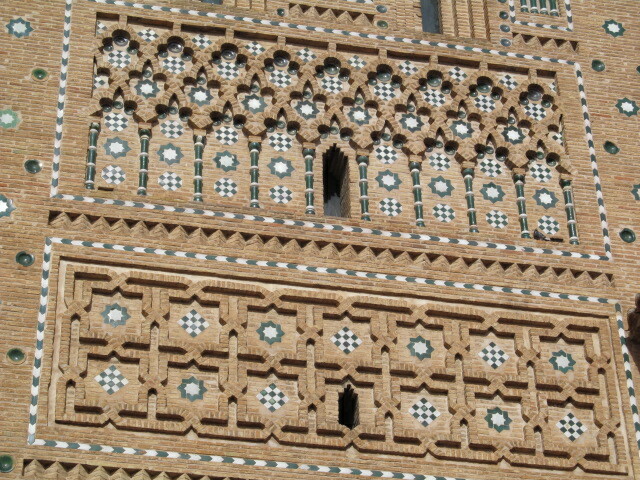 This close-up is actually from one of the others; it shows clearly the decorative use of brick and ceramics as well as the reliance on geometric patterns. There are five of these towers in the city; very quickly they do start to look alike. 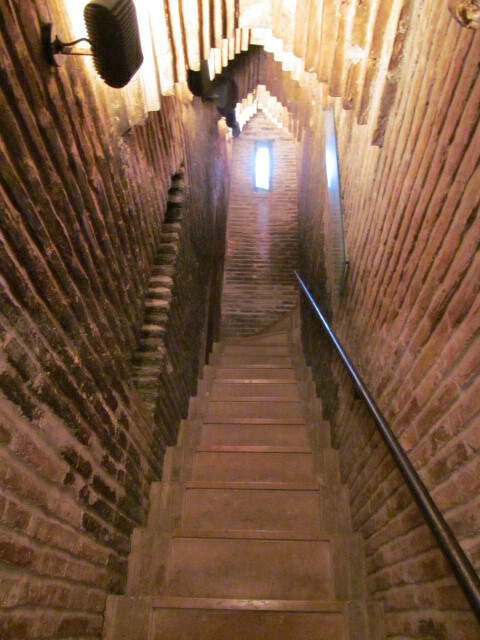 The ceiling on the narrow passageway up to the various levels in the tower has also been carefully and simply designed in brick. 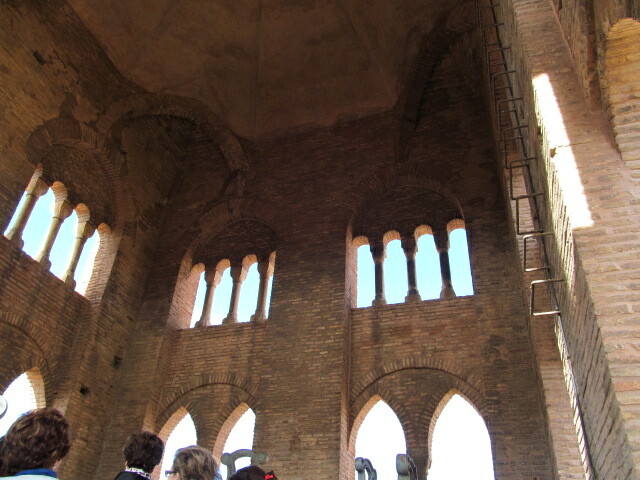 This is the upper room, also beautifully designed, the Christian bell tower inspired my the Islamic minaret. 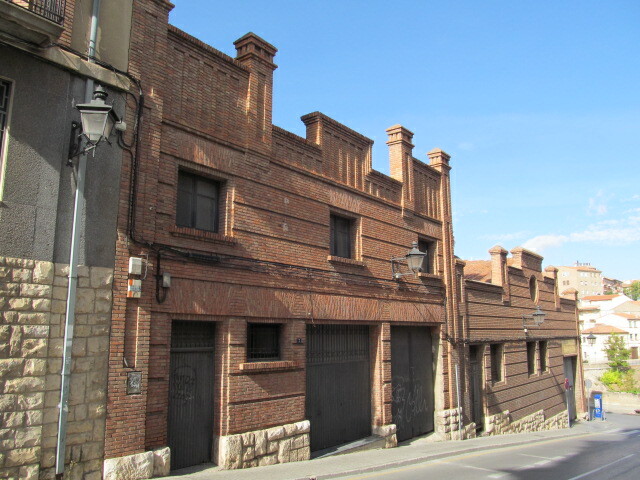 This is a warehouse of a farm co-operative, tucked away on a side street, but it also reveals the mudejar influence in its beautiful but more simply designed brickwork. 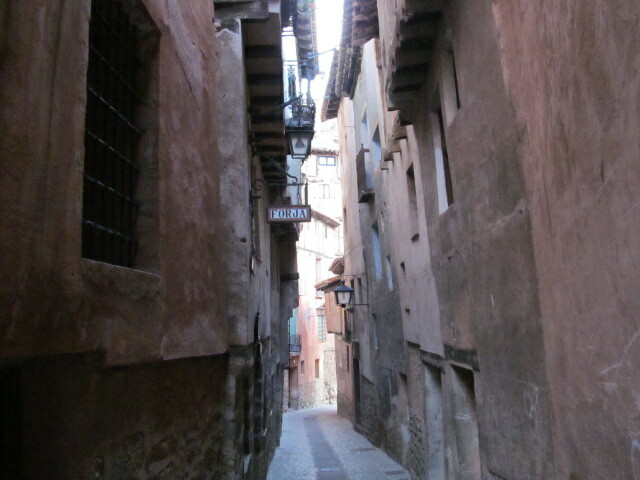 I could show you so many more corners of Teruel. 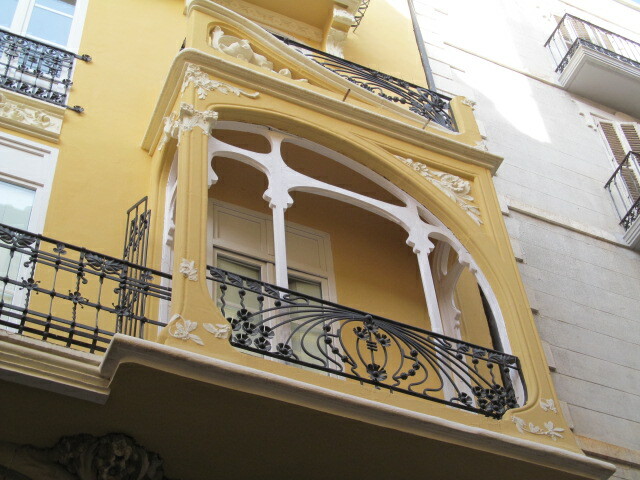 It is also well known for its modernismo architecture, in vogue in the late nineteenth century and early twentieth century Spain. 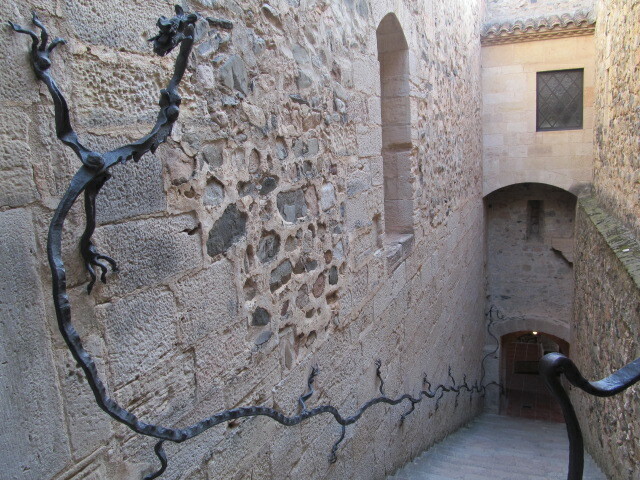 Gaudi was definitely influenced by it and influenced it. 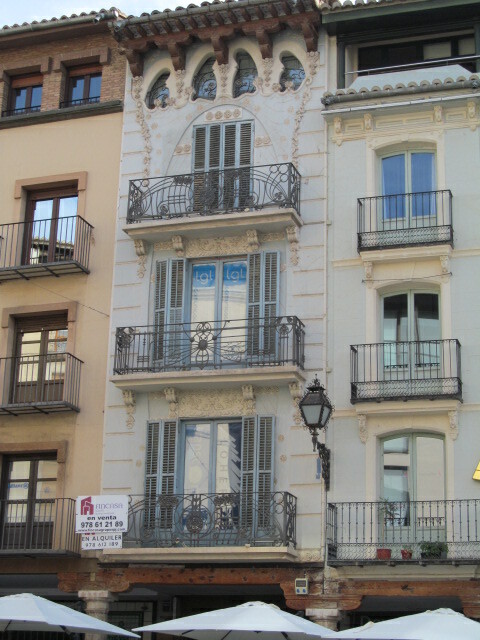 This building is found on the Plaza del Torico in the centre of Teruel. You could say that the upper windows are adorable, almost too adorable, but this is typical of modernismo. Here is a beautiful simple solarium window on a more elaborate building. My aesthetic tends to like the individual elements rather than the accumulation of them. 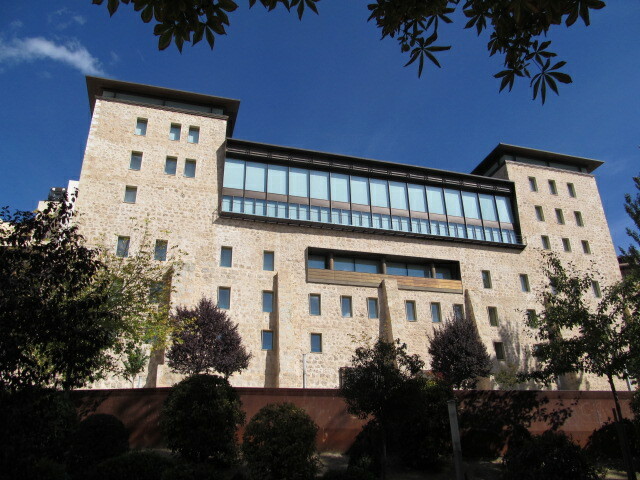 Teruel is not all medieval, mudejar and moderismo; look at the impressive strength and beauty of this public building overlooking a park. It takes its inspiration from castle walls; the upper floor and upper solarium treatments are also reflect traditional architecture. 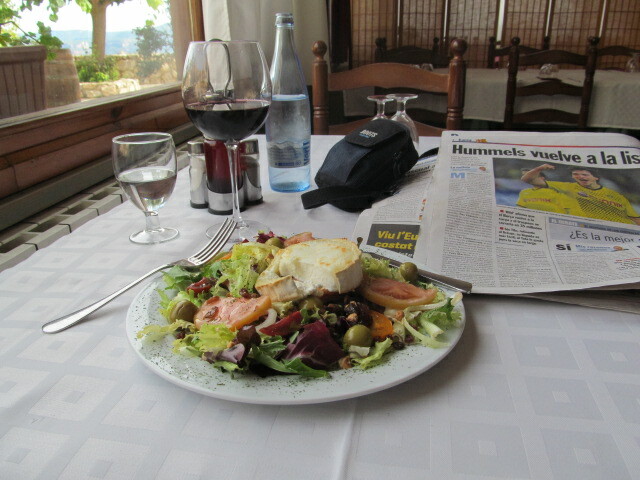 Finally I have to describe another fine lunch. 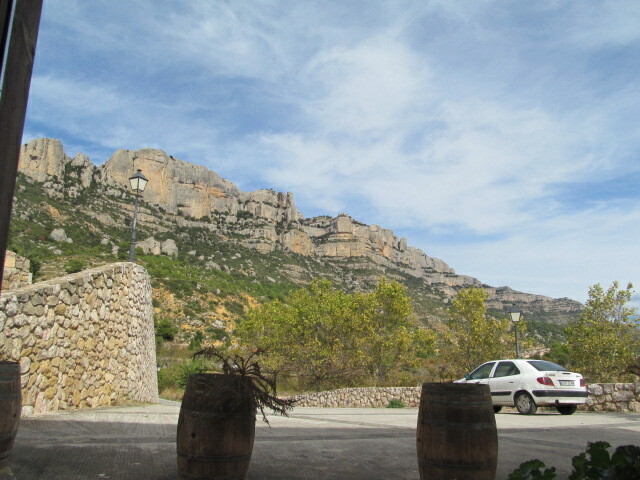 Come to Aragon and Catalonia for the great food of Spain. On a quiet street, away from the busy public squares and outdoor cafes: a risotto with wild mushrooms (’tis the season), small shrimp and asparagus. 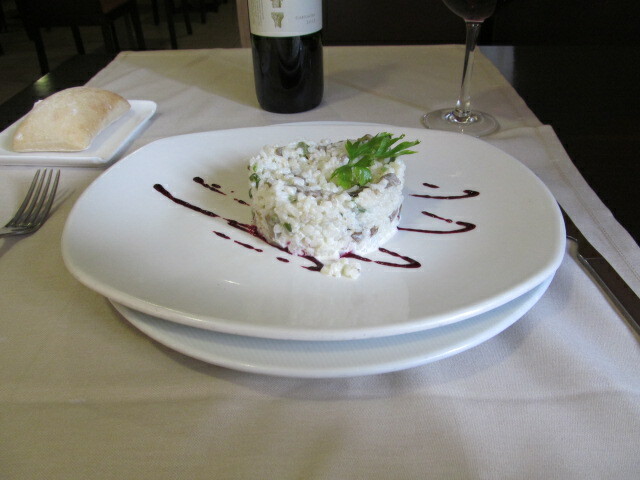 I’ll say it again; risotto fine enough to make any Italian chef envious. Oh yes, and the red wine. On the label a wonderful sentiment: three centuries before this era, the Romans took care of our vines, then the Visigoths, the Arabs, the Christians and now those of us of the present day. 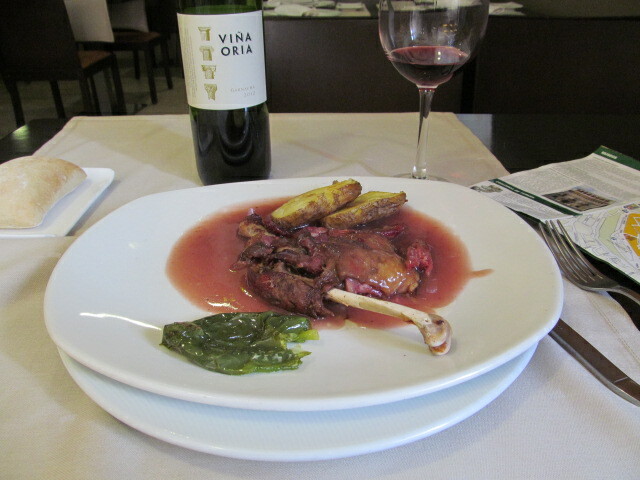 Second course, confit of duck in a dried fruit sauce. Suculento! Works in any language. As tender and flavourful as the duck I enjoyed in a tiny village in the Pyrenees last year, at twice the price, seriously! I did choose dessert (which I rarely do) but the ice cream was described as mudejar, probably because of the layer of cinnamon on top. Very friendly service complimented the meal, two young Turolinos ready to chat with this old fart of a Canadian. 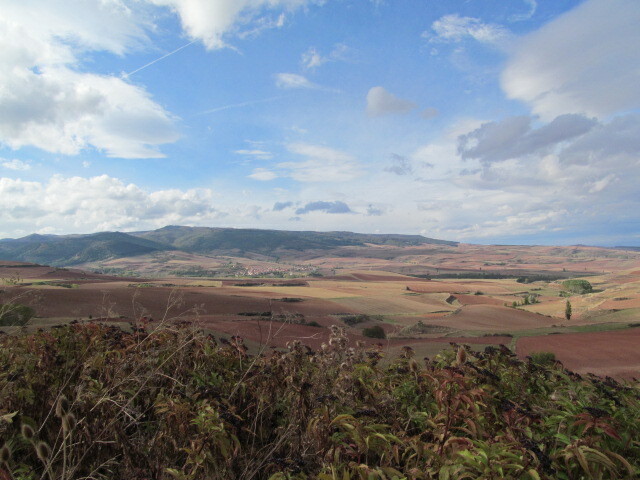 Now to head back to my amazing village for some siesta time. 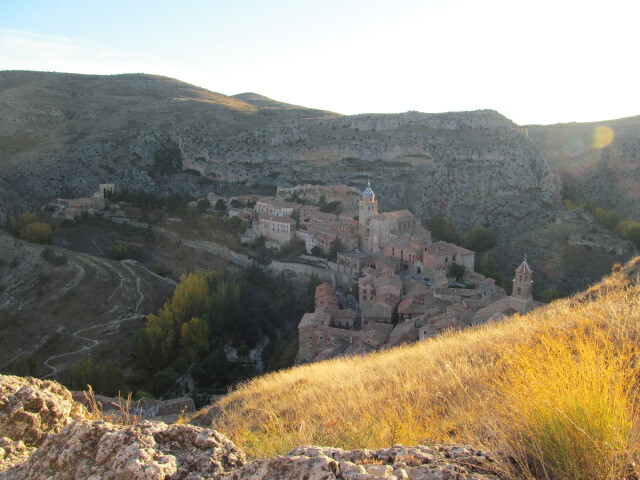 The post about this village, Albarracín, will show up in a few days time. This entry was posted in Uncategorized on October 20, 2013 by agnotarte.